OR&R's Emergency Response Division (ERD) consists of an interdisciplinary scientific team that responds to oil and chemical spills in U.S. waters and helps the On-Scene Coordinator make timely operational decisions. The team is headquartered at NOAA's campus in Seattle; however ERD's Scientific Support Coordinators (SSCs), located around the country, lead the team at spills, drawing on the team's spill trajectory estimates, chemical hazards analyses, and assessments of the sensitivity of biological and human-use resources. OR&R staff members also represent NOAA and the DOC on the National Response Team and Regional Response Teams. OR&R's Assessment and Restoration Division (ARD) protects and restores coastal habitats and resources affected by hazardous materials releases or ship grounding. 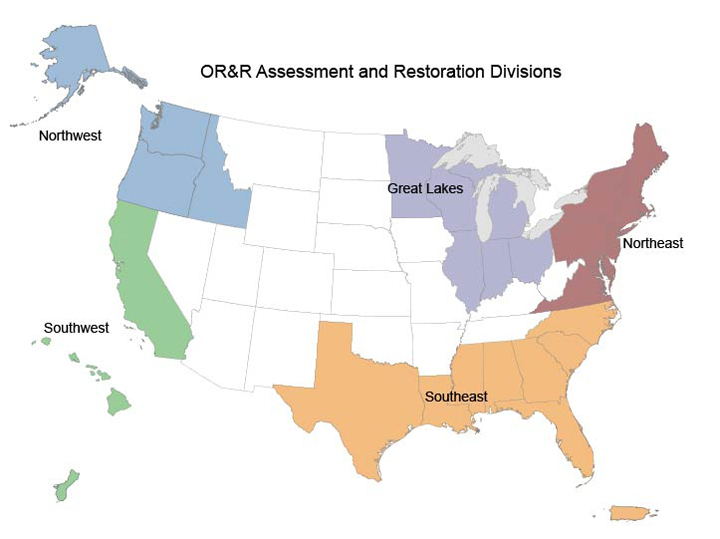 All of ARD's efforts, from assessment to restoration, are coordinated at a regional level. ARD's Regional Resource Coordinators (RRCs) are NOAA environmental scientists who work to provide the technical foundation for assessments of ecological risk and environmental and economic injury from contamination at hazardous waste sites and to improve coordination among trustee agencies. OR&R's Marine Debris Division, headquartered in Silver Spring, Maryland, has regional staff members positioned around the country to support local coordination efforts, track progress of projects, review performance measures, and conduct regional marine debris outreach to local audiences. Contact information for the Marine Debris Division's field staff members is available on the Marine Debris Contact Us page.